The stairs leading up to MALICIOUZ’s studio reveal walls covered in drawings and graffiti. As you walk through the hallway leading to her studio, the characteristic catlike eyes of the women she paints stare at you from the back of a door. MALICIOUZ is a Montreal-born graffiti artist who has graduated from the city’s walls to her own exhibitions. Of Haitian descent, she says her heritage has been a significant influence on her art. Her vibrant graffiti murals can be seen around the Mile End, where her studio is located. She’s been in the shared space for the past five years—it is small, cozy, and paint splattered. There is a mixture of art on the walls, both hers and the artist with whom she shares the space. MALICIOUZ enjoys painting for its communicative power. 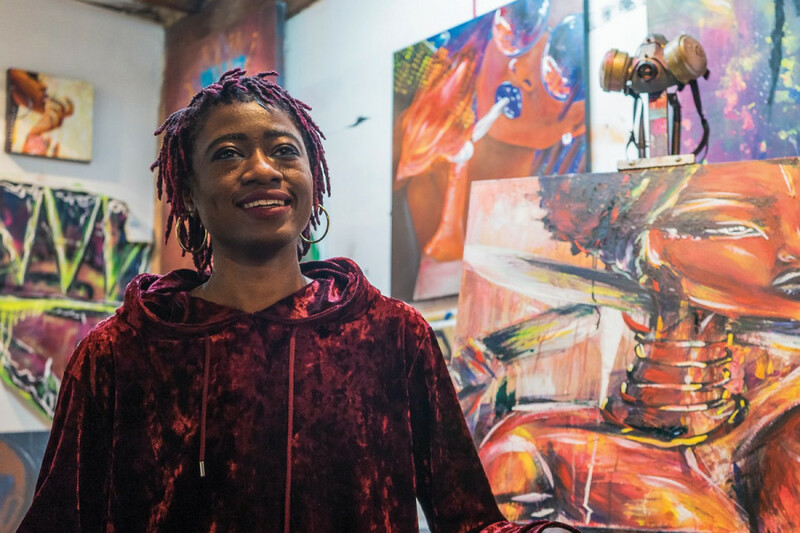 Her paintings and murals are often composed of strong, proud Black women, sporting tribal styles representing the African and Caribbean diaspora. 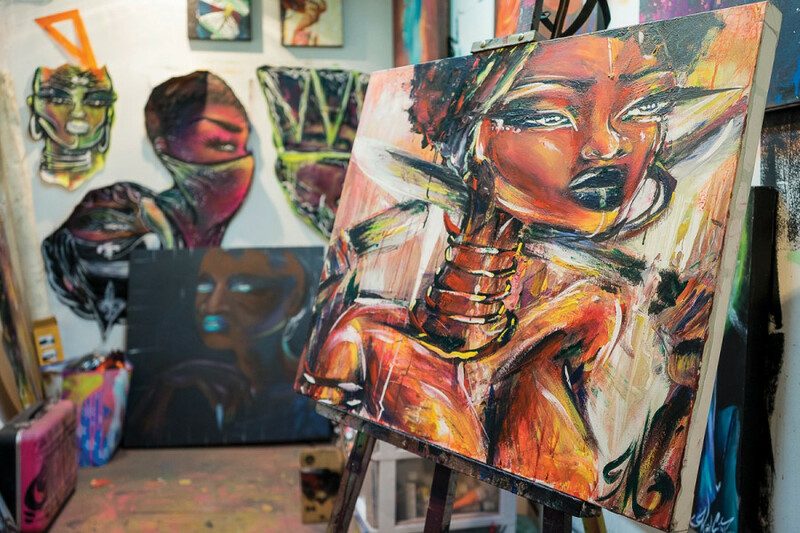 MALICIOUZ aims to represent all cultures that fall under that umbrella, by not committing to, for example, painting only traditional Kenyan jewellery. She stands proudly in her own skin. She comes across as self-contained and quiet, but not exactly out of shyness. Like the figures she draws, there is an intensity to her presence. She projects strength by speaking clearly and firmly—she’s not afraid to stand up for herself and her beliefs. She says her favourite materials to use are paint cans, but she also enjoys painting with acrylic on canvases and developing sculptures. “I’ve always liked using highlighter pink and contrasting colours [for my murals],” she said, explaining that it helps the viewer see them from afar. MALICIOUZ studied graphic design, but was dissatisfied because everything produced for it was “too commercial and not natural,” she said, explaining that she often found herself ignoring the teacher’s instructions. 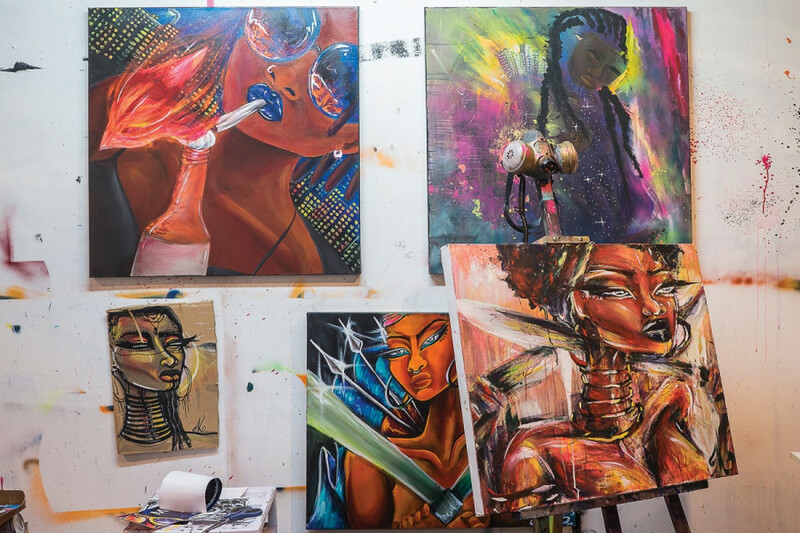 She describes her style of art as “Afro-Urban.” The “Afro” represents the diaspora of various cultures that she draws inspiration from, while the “urban” represents the inspiration she draws from hip-hop and graffiti culture. “They’re royal figures in everyday styles,” MALICIOUZ said. Many of the women she paints are depicted alone, or as mothers cradling babies, though MALICIOUZ explained that she often draws fathers too, behind the mothers, hidden in the shadows. This places the men painted in a “protective” but not central role, MALICIOUZ said. Ali Joseph, MALICIOUZ’s partner, was a fan of her work before they started dating. He’s passionate about art, especially Afro-Urban art, which is why he reached out to MALICIOUZ after seeing her colourful works on Facebook. “They spoke to me,” he said. He invited her to come onto his radio show to discuss her work. After that encounter he fell in love with her as an artist, as well as her talent, dedication, and energy. MALICIOUZ chose the name before her art developed into what you see today, and she says it reflected the spirit she had in her younger years. She continues to like the word for it’s negative connotation, as it helps to exhibit the complexity of her figures to the viewer. “For me it’s about the idea that you can ‘know’ a subject without really knowing them. I’ll have a character that looks radical, but you can see their motivations projected, which aren’t negative, but could appear to be so,” she said. MALICIOUZ is well known in Montreal’s graffiti scene. The artistic style she has developed is unquestionably different, distinctive and powerful. Her start came from spray painting clothes and canvases. 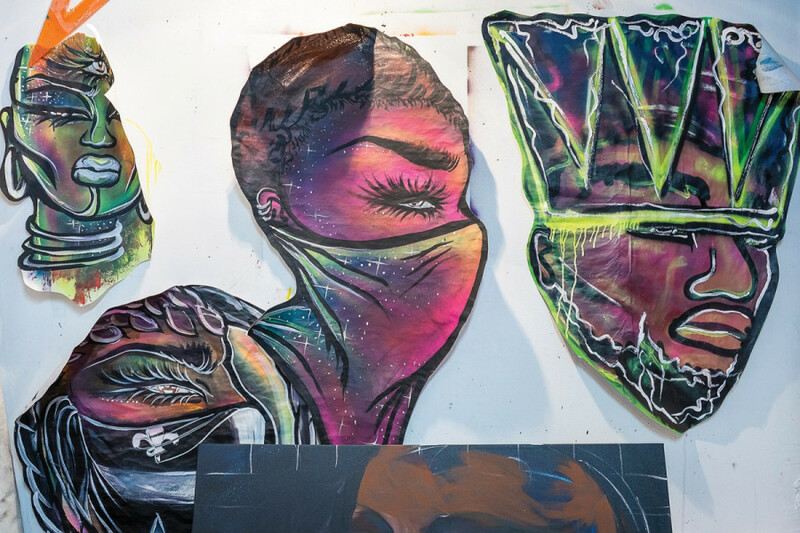 She’s participated in a number of live graffiti competitions locally and nationally, including having represented Montreal in the national competition, Art Battles, in 2014 and 2015. Art Battles are intense, MALICIOUZ said. “Making the painting is ephemeral because we do it in 20 minutes, and then the public sees what you made,” she explained. “My mother has been a great source of inspiration,” MALICIOUZ explained. Many of the women she paints are depicted as warriors. A 2015 painting called Mama’s Gun depicted a woman cradling a baby tenderly in the crook of one arm while looking at the viewer, proudly holding a gun. “It’s a way of illustrating force, but more so the spiritual force of women,” MALICIOUZ explained. The desire to illustrate these complexities is shown in two female figures hung up on the walls of her studio: two Black women whose eyes stare out at you, the lower half of their faces covered by the flag of Quebec, but in black, not blue. “I was inspired by my brother, who is a rapper. The last music project that he did was called Le Côté Noire de Quebec, and the cover was a flag of Quebec which was black, and had his silhouette on it. The painting is a tribute to him,” said MALICIOUZ. MALICIOUZ has an upcoming exhibit called MATRIARCHE, from March 28 to May 13, at l’Espace Mushalaga located at 533 Ontario St. E.